the operation carrying on this great name and tradition. It was Christian & Karla Steinbach that made the company world famous since 1947.
at the Steinbach factory located in the Erzgebirge region of Germany. 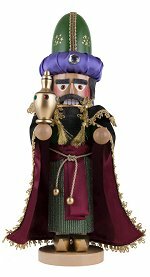 Released in 1994, Caspar is the first in Christian Steinbach's Three Wise Men series - also referred to as the Three Kings. 1994 Introduction - Reissued in 2018 Limited Edition of 1,000 18 inches - 46,0 cm Made in Germany by Steinbach Volkskunst, GmbH Marienberg, OT Gebirge, Saxony, Germany Back in Stock! Released in 1994, Melchior is the second in Christian Steinbach's Three Wise Men series - also referred to as the Three Kings. 1994 Introduction - Reissued in 2018 Limited Edition of 1,000 17-1/2 inches - 44,5 cm Made in Germany by Steinbach Volkskunst, GmbH Marienberg, OT Gebirge, Saxony, Germany Back in Stock! Released in 1996, Balthasar is the third in Christian Steinbach's Three Wise Men series - also referred to as the Three Kings. 1996 Introduction - Reissued in 2018 Limited Edition of 1,000 17-1/2 inches - 44,5 cm Made in Germany by Steinbach Volkskunst, GmbH Marienberg, OT Gebirge, Saxony, Germany Back in Stock! Released in 1994-96, we present Christian Steinbach's Three Wise Men series - also referred to as the Three Kings. The set includes all three figures, Caspar, Melchior and Balthasar. Purchase all three together and receive FREE Shipping! 1994-1996 Introduction - Reissued in 2018 Limited Edition of 1,000 17-1/2 to 18 inches - 44,5 to 46,0 cm Made in Germany by Steinbach Volkskunst, GmbH Marienberg, OT Gebirge, Saxony, Germany Back in Stock!